(Bloomberg) -- It’s just possible that the voters of Finland might get a say in naming Mario Draghi’s successor. The Nordic twist to a Byzantine story on the race for the European Central Bank presidency centers on the scenario of a Finn compromise candidate. In a potential impasse between Germany and France on the European Union’s top jobs, Finland is positioned as a handy alternative from Northern Europe, whose turn it is to get the prize. Two of the five leading candidates eyed by economists for the ECB are Finns, each hailing from different political parties competing in the country’s elections in April. Erkki Liikanen, 68, served on the Governing Council for 14 years as Finnish central-bank governor and has been one of Draghi’s most trusted confidants. His successor, Olli Rehn, 56, earned his credentials as an EU Commissioner during the region’s debt crisis. Only one can get the job. Veron expects one to step aside for his fellow countryman, who could then quite possibly win the role. He sees a good chance the ECB job will go to a Finn in an EU compromise. Hence the possible influence of the Finnish elections in giving political weight for one or other to lean on. Liikanen was a career politician in the Social Democratic Party, which is leading the polls. The Center Party, which heads the current government and is Rehn’s political home, is far behind and unlikely to lead the next cabinet. Finland’s bid for the Draghi’s succession is just one piece of a much larger EU puzzle as governments tussle over the presidencies of the ECB, the Commission and the Council. Germany’s candidate to replace him is probably Bundesbank President Jens Weidmann. France can choose between ECB Executive Board member Benoit Coeure and Francois Villeroy de Galhau, governor of the national central bank, who are both vying for the job. In Finland, slightly more than a quarter on a panel of leading economists say the ECB presidency would be beneficial for the country, which has never held the post before. The Finnish economy accounts for just 2 percent of the euro area, with an even lower share of the region’s population. Of greater importance in the history of the euro is that it was here in the continent’s northernmost corner -- one hour before everyone else on Central European Time -- where the currency had its debut. Liikanen’s experience is his biggest trump card but also his biggest liability -- he would be the oldest-ever person in the job. 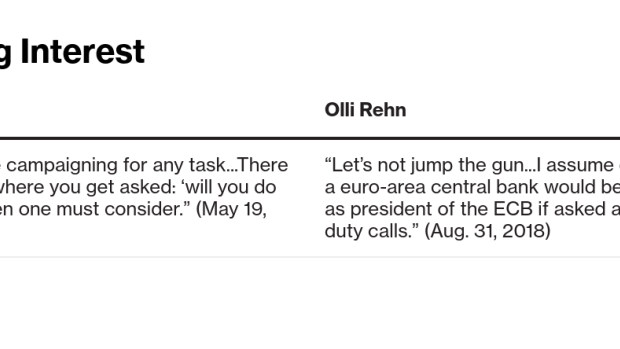 Rehn is seeking to make his mark by actively shaping the ECB’s post-crisis way of setting monetary policy, but could face an uphill battle to win the support of southern European nations who associate him with Weidmann’s more conservative approach to central banking. The two men’s careers have touched regularly: in the late 1990s, when Liikanen was the EU’s budget commissioner in Brussels, Rehn was head of his cabinet. During the debt crisis, they met often in the ECB’s tower in Frankfurt when then-Commissioner Rehn participated in the Governing Council’s meetings. Most recently they served on the Bank of Finland board together for 16 months. Liikanen and Rehn both hail from the city of Mikkeli in the Finnish lakelands. They both enjoy jazz and sport: while Liikanen does marathons, Rehn still plays football. Given how well they know each other, politicians from both sides might be hoping the two men find a way to settle the matter before someone else needs to choose. --With assistance from Piotr Skolimowski, Zoe Schneeweiss and Patricia Suzara.